14ymedio, Havana, 11 October 2018 — Cojímar, the town east of Havana that has been linked in literature and the collective imagination to the name of Ernest Hemingway, is now experiencing its own battle against the Giant African Snail. The invasive species, which has been spreading throughout the Island for the last four years, has found in this coastal community an ideal place for its spread. When the first specimens showed up they seemed nice, “almost funny,” she remembers. Then, as they began to multiply faster, the worry began. “We had heard on the Internet about their arrival in Cuba several years ago, but we never thought that they would arrive here,” says Carmen. “We have tried everything and they are very resistant,” she adds. “Some people throw salt on them and say it leaves them half stupefied but I can’t waste the little salt they give me at the bodega on that.” The woman regrets that in addition to the warnings and some Public Health technicians who have passed through the place, no one has come to tell them how to eradicate them. In recent weeks there have been reports of the presence of the snail in Placetas, Cabaiguán and Sancti Spíritus. 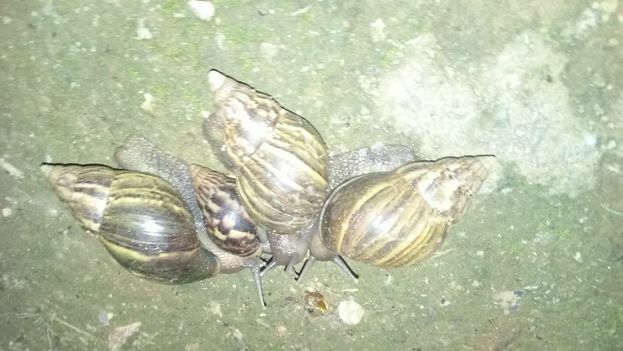 Even the official press, reluctant to publish information that generates alarm among the population, has confirmed the advance of the African snail, but without specifying any approaches to deal with it. In July 2014, this newspaper uncovered the arrival of the invasive species Achatina fulica in Cuba. The alarm was raised by a citizen of the municipality of Arroyo Naranjo in Havana. The farmer, when inspecting his plantings, spotted snails between 5 and 10 centimeters long on his crops and called the institutions responsible for public health to inform them. Days later the state press confirmed the story.